Psst! Wanna see some magic? How about I make some bad habits disappear and turn you into an amazing trainer? I don't care what level you were at yesterday, tomorrow you will be looking like a horse-training whiz. Two days from now your friends at the barn will be pointing at you excitedly, stepping from your path reverently and cooing "oooh" as they watch you ride. I'm telling ya, you will be singularly amazed -- and you're gonna love this trick. Thanks go to Josh Lyons who taught me this concept during the John Lyons Certification program. First, we're gonna do an exercise to get your mind right and build up a little muscle memory. Step outside to an area where you can pick up a handful of rocks and stand about twenty-five feet from a building or solid fence. Take a rock and whip it overhand at the building, watching the rock fly hard and fast through the air, never averting your eyes until you hear the "whap" of the rock hitting the wall. Do that several more times in rapid succession. Next, take a rock and throw it underhand toward the building - and do it in such a way that the rock flies lazily, far more slowly than before. While the rock is in the air, look at your hand and another rock. Lob that rock. (It's paramount that you turn your attention away from the first rock to a second rock as soon as you release the first. This timing is critical.) Do this several more times, pitching a rock out slowly and turning your attention to another almost immediately, repeating the sequence. You need to remain relaxed throughout; if you find yourself spitting out rocks like you're competing in a kids' game show, then you need to step farther away from the building and slow things way, way down. The way you threw the rock at first (overhand, fast) - that's the way you trained yesterday. You picked up the rein and held it with conviction until you saw the horse make the move you had envisioned. You wanted a step to the right and you held the rein until his foot stepped firmly to the right. Only after the rock hit the wall did you move on. The way you threw the next group of rocks (lobbing one, changing your attention to another and lobbing that), that's the way you'll train tomorrow. You'll pick up the rein, release it the instant you believe the horse "has the thought" and move on to setting yourself up for your next request, trusting the horse to follow through and do his part ("step to the right") just as you trusted the rock to follow it's path and hit the wall. 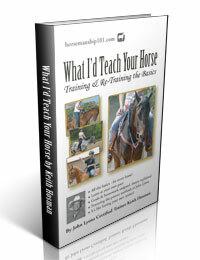 How will you know when the horse "has the thought" and you can release and move on? In the same way that I would know that you were about to sidestep to the left when I see you shift your weight onto your right leg. Be vigilant as you ride and you'll start to notice a pattern in everything the horse does. What did your horse do one second before he successfully completed your last request? Did he lean or shift his weight or lift his head or bow his ribs? How does this timing help us? The quicker you can release, the better clue the horse has as to what you were looking for. Release in three seconds and he might think you released because he stepped to the right -- or -- he might think it's because the bird flew away, the dog scratched himself, a cricket chirped or the other horse pooted. Release half a second later and he has far fewer choices. While "three seconds" gave him five things to mull over - half a second might have given him one or two. Fewer choices means he'll figure things out far more quickly. Put this theory into practice while it's fresh on your mind; get out and lock it into your muscle memory so that it becomes second nature and integral to your training method. You should begin "releasing on the thought" with virtually everything you do with your horse, but I'll use "moving his right leg to the right" in the following small example: As your horse moves off at a walk or trot, pick up and place pressure on the right rein with your right hand, concentrating on - and asking for - his right foot to step directly to the right. In your mind's eye, pick a specific spot where you'd like to see that hoof land - and hold until you feel the horse shift his weight and think there's a good chance he's "got the idea" and is setting himself up to follow through. (Releasing at that moment is akin to you "trusting the rock to follow through and sail on to hit the wall" as you turn your attention to the next rock.) At that moment he's shifting his weight and moving his foot - and you are either setting yourself up for your next request (whatever that might be, picking up speed or stopping or turning on the haunches, whatever) -- or -- you are simply "considering it done" and relaxing to enjoy the ride. Obviously you don't have to follow up with any particular instruction, you can simply "ride" after your release -- it only matters that you "release on the thought" and trust your horse.